Cover-up: DHA & Fish Oil Scam shortening all our lives…! Yes, you are probably consuming it too. They are putting it in everything! What if fish isn't the ideal food we're told it is? What if fish oil — just-made or completely rancid — is a poison for most of us? What if so many tumors on so many pets are caused by polyunsaturated fatty acids? What if so many well-meaning veterinarians are slowly killing so many pets by recommending fish oils? Can cod liver oil kill your dog? Your cat? Your horse? Your chickens? Can cod liver oil kill a human being? Government guidelines advise eating fish only 2-3 times a week so we don't get overburdened with mercury and other toxins. What if this warning is a sham? What if it's for a more underhanded reason? What if it's to keep human Yellow Fat Disease at a subclinical, "idiopathic" level so mega-corporations can keep banking billions of dollars selling us fish oil supplements and fish products that are dangerous to our health? What if many diseases of "unknown cause" really do have a cause — known only to certain corporate and government insiders? Not often can you make a bigger difference for yourself and your loved ones. Don't skimp on your research into Yellow Fat Disease…! Plenty details you may consider important are in the books, but these soundbites will get you up to speed on the basics. Interviews that heavily feature Yellow Fat Disease are the dates indicated below, the ones with Yellow Fat Disease in the title, and the one on ORN, Sept. 4, 2017 or ORN, Sept. 21, 2017, for example. "You are when and what you eat…!" Aren't omega-3s the healthy and Essential Fatty Acids? Polyunsaturated fatty acids generate oxidative stress — an overload of free radicals. More oxidative stress creates more inflammation creates more lipo-pigments, namely, lipofuscin and ceroid "wear and tear" granules. Lipo-pigments are rich in polyunsaturated fatty acids (no saturated fats), and are the secondary cause of yellow fat disease. The primary cause is omega-3 fatty acids — ALA (alpha-linolenic acid), EPA (eicosapentaenoic acid), and DHA (docosahexaenoic acid). "Essential fatty acids (EFA) are, according to the textbooks, linoleic acid and linolenic acid, and they are supposed to have the status of 'vitamins,' which must be taken in the diet to make life possible. However, we are able to synthesize our own unsaturated fats when we don't eat the 'EFA,' so they are not 'essential.' The term thus appears to be a misnomer. [M.E. Hanke, 'Biochemistry,' Encycl. Brit. Book of the Year, 1948.]" "The amount of polyunsaturated fatty acids often said to be essential (Holman, 1981) is approximately the amount required to significantly increase the incidence of cancer, and very careful food selection is needed for a diet that provides a lower amount." What about health food gurus stressing the importance of DHA, EPA, algae, and marine phytoplankton? Once they eliminate PUFAs from their brain, they'll no longer advocate them. If you want a surefire way to dumb down humanity, load up infant formula with PUFAs, and force them on schoolchildren. "[Jose] Guevara [105 years old] lives in the Nicoya peninsula of Costa Rica. Blessed with sandy beaches and tropical forest, it's something of a backpackers' paradise. It's also an area identified as a "Blue Zone" — one of five hotspots around the globe where people live measurably longer lives." The question is, "Where's the fish?" 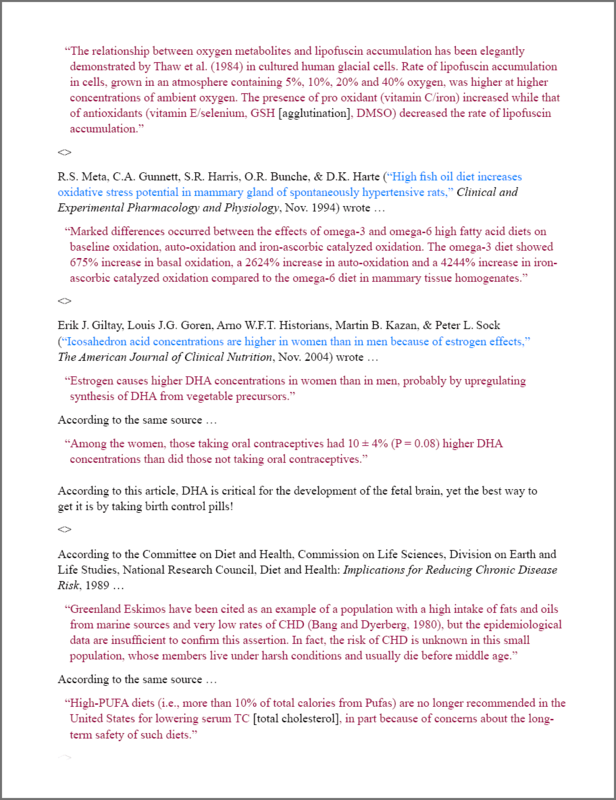 "Where's the DHA and EPA 'required' for intelligence and longevity?" Okinawa centenarians eat fish often, and seem to live very full and healthy lives? Until recently, less than 1% of the Okinawan diet came from animal products. More animal foods were added during the mid-20th Century, and pork is now considered a delicacy on the Ryukyu Islands. Fish oil advocates often reference Okinawa, yet fish-eating is minimal. Okinawan cuisine revolves around the Okinawan sweet potato and bitter melon. Fermented tofu and millet brandy were too pricey for the lower classes. Fish never was a significant part of the Okinawan diet (they knew better), and, even today, our finned friends are a tiny part of their cuisine. These small portions of marine food are warm-water fish, poorer in omega-3 fatty acids than cold-water fish. The Okinawan ocean temperature is similar to Fort Lauderdale, Florida, since both cities are pretty much at the same latitude. The human liver is robust enough to deal with reasonable amounts of most toxins, including long-chain fatty acids such as docosahexaenoic acid (DHA), eicosapentaenoic acid (EPA), and docosapentaenoic acid (DPA). Yellow Fat Disease is mostly caused by highly-unsaturated fatty acids (DHA, EPA, DPA, and ALA), and less by PUFA (linolenic acid and linoleic acid). Why are crocodiles, who have lived for 2 million years, dying so quickly today? "Compared with other sites, analysis of stomach contents of catfish from the Olifants Gorge and the Sabiepoort strongly suggested that consumption of a predominantly fish diet was associated with the development of pansteatitis in these fish. In a farmed population of catfish used as positive control, development of pansteatitis could be ascribed to consumption of rancid fish waste from a trout slaughterhouse. In the Olifants Gorge, alien invasive silver carp, Hypophthalmychthys molitrix (Valenciennes), seasonally migrate upstream out of Lake Massingir to spawn. This schooling species is an obligate phytoplankton feeder with consequent high levels of adipose tissue n-3 polyunsaturated fatty acids. In the Olifants Gorge, at least, this may explain seasonal exposure to levels of polyunsaturated fats in the diets of catfish and crocodiles to which these animals are not adapted. The possible roles of diet, membrane lipid composition and metabolic rate of fish, sediment pollution and seasonal drop in environmental temperature in the pathogenesis of pansteatitis in the catfish are discussed. Further studies are needed to verify some of these speculations." Hit the blue buttons to view descriptions on my e-books page, or order directly below. You get both color-enhanced and B&W versions in PDF, EPUB, and MOBI. The FULL STORY in 360+ quotes (& more) to decide for yourself! This list is not to push you into subscribing, but helps to give clues about some of the angles that are addressed more completely in the books. If you do want to gain access to the entire Sun Sync Nutrition site, these blogs (and hundreds more), it currently has a one-time-only subscription price of $99.99…! "Creative Consciousness will not meet your individuality all the way. The glory of God is to correct your own mistakes. Your immune levels will meet you half-way."